I received this information prior to Christmas and have been waiting for the right time and place to bring it to light. Now seems about right. 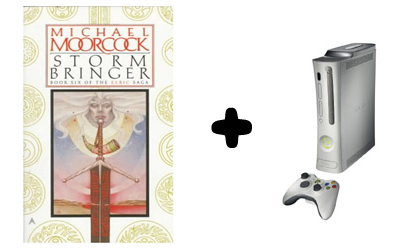 Author Michael Moorcock’s Storm Bringer, the Elric Saga is making it’s video game debut in late 2008 or early 2009. This information came from a source “directly involved with the development of the game” and seems quite reliable. Below is a copy of the information that was sent to me. New game, Stormbringer, “The Black Blade,” is testing the waters. They have yet to decide whether they want to deploy the game on the Xbox 360 platform or the PS3 platform. Introducing: Stormbringer — a new 3rd person fantasy-action game for the PS3 & X360. In this game, you are Elric, the emperor of Melniboné, ruler of a once great but now decaying island country. Formerly a mighty warrior nation, it is now a slave to its own decadence and customs, and under attack from all sides. Desperate to save your homeland, you strike a bargain with Arioch, the Lord of Chaos, pledging your servitude in exchange for the ultimate weapon – in exchange for Stormbringer. ENTER THE WORLD OF MICHAEL MOORCOCK – along with Lord of the Rings, the Stormbringer series has influenced an entire generation of fantasy fiction. Moorcock’s dark vision combines legend, science, and sorcery into a twisted realm unlike any other. Elric is a true anti-hero who plays a key role in the ultimate battle between Chaos and Law as he struggles against his own grim fate. EXPERIENCE A VISUAL MASTERPIECE – The world of Stormbringer is spectacularly brought alive with state-of-the-art Unreal 3 technology, the same engine that powered Gears of War. Elric’s mysterious land is packed with epic locales, populated by exotic creatures and fused with an advanced physics engine that allows for deep world interaction as well as incredible destruction as you topple pillars or level buildings to achieve victory. ENGAGE IN FANTASTIC COMBAT – You wield Stormbringer, a blade unmatched in the entire world, using a deep combo system that allows you to move quickly from foe to foe or juggle enemies with ease. Keep the momentum of the fight going by harvesting souls, growing visibly stronger, and cutting larger arcs of destruction, ending in staggering finishing moves. In distant lands you will build repertoire of combat styles, learning new moves as well as gaining unique advantages of your toughest foes. HARNESS FORBIDDEN MAGIC – channeling the energy harnessed by your whirling blade,you can also unleash dark magic that can rain molten fire or unleash monstrous demons to rip your opponents limb from limb. Your journeys will lead you to forgotten lore of Chaos and Law that can combine with the might your sword to keep your enemies at bay or twist their minds. Gain the favor of demons or elementals that can give you the ability to travel to new realms, or fight in entirely new ways… for a price. FIGHT ON AN EPIC SCALE – Neither size nor number matter to the might of Stormbringer… Your dark powers are enough to conquer any, a towering Melnibonéan war machine or even a hundred-foot-tall Burning God. Fight alongside your own legion and use your magic to spur them to victory, or rely only on your own chaos abilities and the hunger of your blade to conquer the vast armies laid before you. STRUGGLE FOR YOUR SOUL – Stormbringer is the source of your strength, but also the root of your corruption. As you take more souls, your power intensifies, but your devastating attacks will make it difficult to keep the sword from slaying your friends as well… beware that your bloodlust may ultimately make them indistinguishable from your foes. If you instead embrace this dark fate, the most terrible powers can be gained by taking the souls of your closest allies, those which Stormbringer finds the most sweet. Taking this road transforms you into an instrument of destruction, but will drive the conclusion of your tale down a darker path. Upon first read, it almost sounds like the Fable sequel we’ve all been waiting for. But I’ll let you be the judge of that. My source added that this title may end up being a PS3 exclusive, or an Xbox 360 exclusive, or it may launch on both consoles. At this time, however, it seems very promising that the 360 is locked in. Posted in GamingTagged exclusive, games, Storm Bringer, Stormbringer, xbox 3601 Comment on EXCLUSIVE: Moorcock's Storm Bringer saga coming to 360!